Your Ultimate 7-Day Las Vegas Itinerary! Las Vegas. Home to jaw-dropping accommodations, incredible views and celebrity concerts, this desert mega city is also rich in history, has character and charm in spades, and a food scene like nowhere else on earth! Let’s make one thing clear, seven days in one of the world’s greatest cities is not nearly long enough. You could spend weeks exploring the sights and sounds of Las Vegas and not even dent the sides—though you might want to take it easy on the indulgent food! But if you are making a trip to the city that literally never sleeps and only have one week up your sleeve, this is the only itinerary you’ll need to live it up in Las Vegas! 12:00pm | Don’t waste valuable minutes unpacking, pull out your best togs and hot foot it poolside to one of Las Vegas’ Insta-worthy swimming pools. Azure at The Palazzo is the ultimate in poolside luxury; splash out on a private sun bed and slide right into holiday mode. 5:30pm | If you’re able to peel yourself off that sun lounge after an afternoon of R and R, grab a bite to eat. Las Vegas is renowned for its diverse and glamorous food scene, but we say get into the USA swing of things and order the Kobe Burger at N9Ne Steakhouse at Palms Casino Resort. 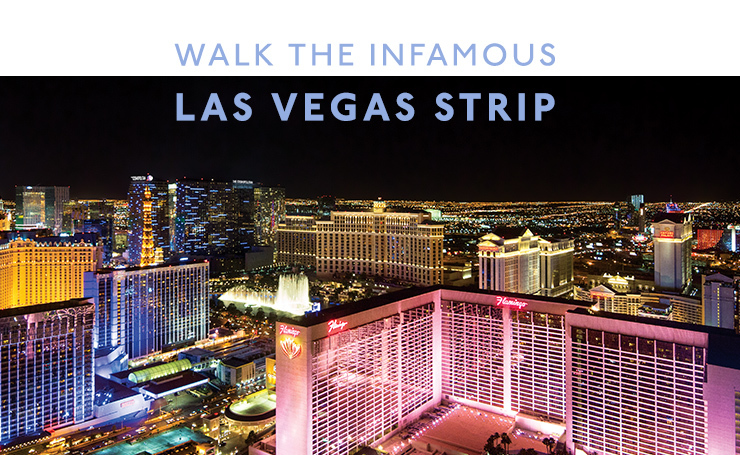 8:00pm | Walk off that indulgent meal with a walk along the infamous Strip. This is the road that put the spotlight on Las Vegas. Checking out the iconic landmarks here is a full time gig! 11:00pm | Make like Danny Ocean and the crew—spend some time ooh-ing and ahh-ing at the magnificent Fountains of Bellagio. 11:00am | Obviously the only way to see the Nevada desert is by helicopter. 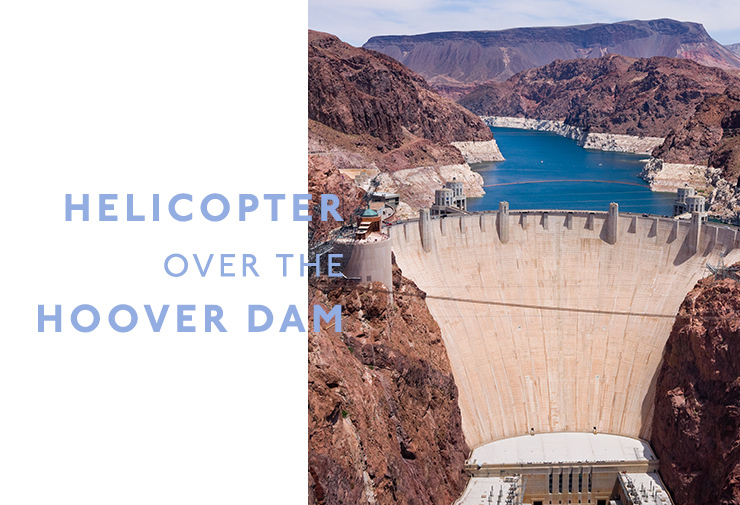 Cruise over the concrete masterpiece that is the Hoover Dam and take in those whopping views! Check out Dream Catcher, Golden Eagle, Maverick Helicopters, Sundance Helicopters, Ace Of Adventure, or Silver Cloud helicopter tours for your ticket to the sky! 5:00pm | Nowhere does a good sundowner better than Las Vegas, so put on your glad rags and gear up for a night on the town. For pre-dinner drinks, RHUMBAR at The Mirage has a fabulous alfresco bar with uninterrupted views of the Strip. 7:00pm | Nothing says Las Vegas like a headline show! Anyone who’s anyone has stood centre stage here—from Mariah Carey to David Copperfield, Prince, to the King himself—there is an award-winning, toe-tapping show for everyone, just ask anyone who’s ever seen Showstoppers at The Wynn. For a real show-stopper, check out Sir Elton John’s The Million Dollar Piano, at Caesars Palace’s The Colosseum. Breathtaking! 8:00am | Breakfast time! Order the epic short rib benedict at The Henry in The Cosmopolitan of Las Vegas, washed down with a strong latte. 11:30am | Treat yourself to a day of pampering, and while away an afternoon at Glow, A Mandara Spa at Tropicana Las Vegas with their signature Glo2 facial and a luxurious full body massage. Heaven! 5:00pm | Time to flex that plastic and shop til you drop! From jaw-dropping, Roman-themed décor at The Forum Shops at Caesars to the famous Las Vegas South Premium Outlets, to designer boutiques on Le Boulevard at Paris, Las Vegas is a shopping mecca! 9:30pm | After all that shopping it’s time to give your legs a break. Take a load off and take a chilled out ride on a gondola, floating under the bridges and streetscape of Venice at The Venetian. Your gondolier will even serenade your journey! How romantic. 4:00am | Rise and shine with an early start for a day at the iconic Grand Canyon. Didn’t think a giant hole in the ground could take your breath away? Think again, it’s spectacular. 6:00pm | Be sure to make reservations at Adler & Birch at The Orleans. After a day of prime views and desert air, your belly will be in need of feasting. 10:00pm | Put on your dancing shoes and party the night away at Foxtail SLS Las Vegas. 11:00am | All that fresh air was great, but you’ll want to reacquaint yourself with the hustle and bustle. Check out downtown Las Vegas on a guided walking tour, and discover how this city in the middle of a desert came to be. 2:30pm | Before the light fades, take a ride on Slotzilla’s 12-story Zip Line for some awesome views across downtown Fremont, or check out the city’s rich history at the Mob Museum. 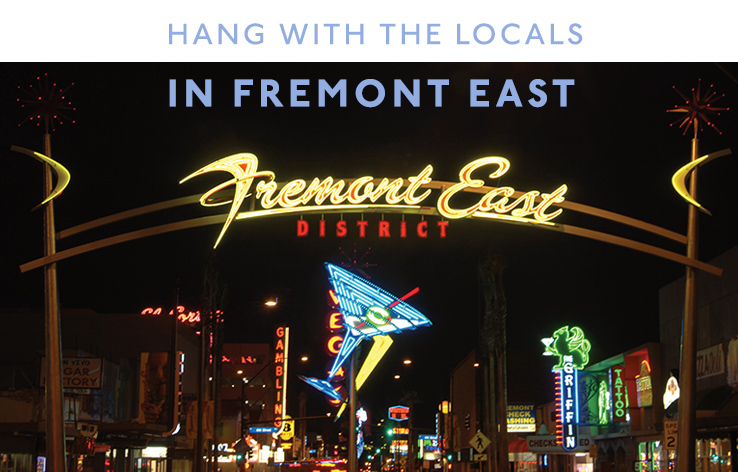 5:30pm | Make tracks to Fremont East District, where the locals like to chill. Home to Las Vegas’ premiere independent bar and live music scene, check out Commonwealth for their fabulous cocktails and rooftop seating. 9:00pm | Stick around for a feed in downtown Vegas, with dinner at Du-Par’s Restaurant & Bakery on Fremont Street. An iconic, and world-famous all -American diner, settle in to one of their leather booths with a slice of their signature home-made pie. 12:00pm | After smashing the fried chicken and waffles at Hash House A Go Go at The Rio (the very waffles seen on Man vs Food! ), spend an afternoon at the Neon Museum. Selfie sticks at the ready! 4:00pm | Get up close and personal with the underwater world at Shark Reef Aquarium, Mandalay Bay Resort and Casino. 7:30pm | Hungry? Park yourself at Benihana at Westgate Resort and Casino for an unforgettable Japanese-style dining experience. 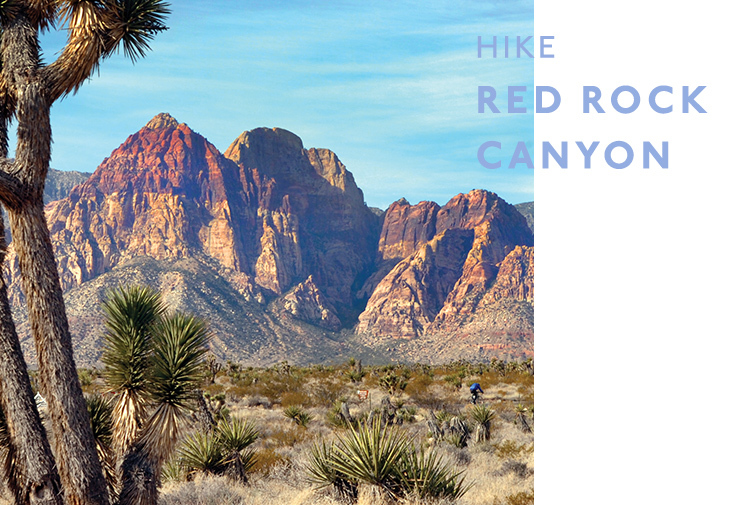 8:00am | Get the blood flowing with a morning hike in Red Rock Canyon National Conservation Area. Only a 30-minute drive west of the Strip exercise is easy with views this spectacular! 1:00pm | Take a ride on the High Roller on Las Vegas Boulevard, the tallest observation wheel in the world! Needless to say, the views of all of Las Vegas will take your breath away. 7:30pm | Splurge on your last meal – you’re in Vegas after all – at Costa Di Mare, one of the finest seafood restaurants in town. They fly in their shellfish on a daily from Italy. Magnifique! Editors note: This article is sponsored by Tourism Las Vegas and proudly endorsed by The Urban List. Thank you for supporting the sponsors who make The Urban List possible. Click here for more information on our editorial policy.